Results from a measurement campaign emulating the high altitude platform (HAP)-to-indoor communication channel at S-band are presented in this paper. A link was established between a transmitter carried by a helicopter, representing the HAP, and a receiver placed at several locations in different building types including an airport, an office building, a shopping mall, a residential house, and a skyscraper. A wideband, directive channel sounder was used to measure building entry loss and time delay spread. Results of the building entry loss are presented as a function of building type, elevation, and building entry angle. Results of delay spread for each building are also provided. High altitude platforms in the form of an airship or an airplane stationed in stratosphere, about 20 km above the earth's surface used to deliver a range of services, are expected to offer an alternative to terrestrial and satellite-based communication systems . Although there exist well-established models for predicting propagation effects in terrestrial and satellite links that may be applied to the HAP scenario, specific conditions in the HAP-to-indoor geometry require further investigation and channel modeling for this particular application. Two main issues are of importance when modeling the outdoor-to-indoor channel, namely, the entry loss and the delay spreading of the received energy. Entry loss is the most critical given its very large values, while the delay spreads are in the order of tens of nanoseconds (ns). Echoes produced by interactions (reflections, diffractions) with other buildings will, in general, be negligible in comparison to the energy entering the building by direct illumination of its façade. The term building entry loss used here corresponds to the ITU-R Rec. [2, page 1411] definition where it is defined as the excess loss due to the presence of a building wall and other building features. Building entry loss largely depends on the building type, construction, and electrical parameters of material used. Penetration loss of various building materials coming from laboratory measurements at 1–8 GHz can be found in . Electrical parameters of building materials covering S-band frequencies are reported in [4, 5]. Many other aspects influence the building entry loss, like the position of the receiver inside the building, elevation of the transmitter, and so forth, making it difficult to accurately estimate the level of received power inside a building. Nevertheless, decrease of the entry losses into building with floor height can often be observed [6, 7]. Measured building entry loss in the frequency range close to 2 GHz can be found in [8, 9]. Measurements of rms delay spread of received signal within buildings close to S-band frequencies are reported in [10, 11]. 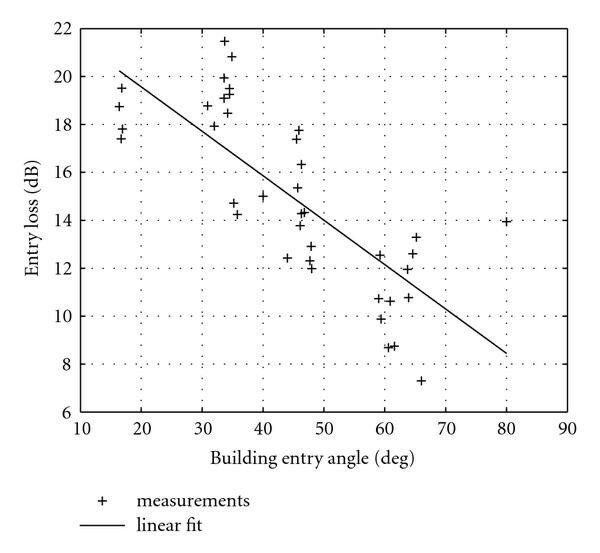 In this paper, an attempt has been made to present values of building entry loss for different buildings varying in type and material as a function of transmitter elevation and building entry angle. Values of time delay spread are also provided. A single-input multiple-output (SIMO) measurement campaign has been carried out yielding a unique dataset for modeling the HAP-to-indoor channel. A helicopter carried a wideband channel sounder transmitter flying in circles around a multiple patch antenna receiver located inside a building. The helicopter was stationary during the measurement procedure. Through power delay profile information, entry loss and multipath spreading were measured. This experimental setup has been used in six representative buildings: a major international airport, a local airport, a suburban shopping mall, an inner city office building, a city skyscraper, and a detached residential house. In Section 2, a description of measurement setup together with the procedure of the measured data processing is provided. Section 3 presents the overall building entry loss, building entry loss as a function of elevation and entry angle and the results of time delay spread. Section 4 contains the conclusions of the presented results. The building penetration loss and the delay spread were measured as a function of elevation angle and building entry angle. All measurements were performed with the helicopter facing the wall behind which the receiver was placed. The distance of the helicopter from each building was 1 km or 2 km. The range of elevations and azimuths covered by the helicopter was from 15° to 60° and from −80° to 80°, respectively. Building entry angle incorporates both elevation and azimuth; it is zero for grazing incidence and is equal to 90° when the transmitter is in the direction of the normal to the building surface. To clarify the data analysis process, the different data sets and preprocessing steps taken before the actual analysis are summarized. The data set consists of a number of "products." The Propsound channel sounder  from Elektrobit, (Oulu, Finland) was used, providing an "instantaneous" data set consisting of one "complex" ( and ) channel response versus delay per patch antenna and polarization. These instantaneous measurements are called cycles. The channel sounder transmits a pseudorandom sequence where different code lengths are possible. Depending on the code length chosen, the update rate of such set (full scan over all antennas and both polarizations) varies giving rates ranging from several tens of cycles per second to a few hundreds. The transmit antenna was circularly polarized (RHCP) while the receive antenna consisted of a set of patch antennas (SIMO) with two orthogonal linear polarizations covering a surface that approximates a semisphere. From each of the two linearly cross-polarized measurements, both the received copolar (RHCP) and cross-polar (LHCP) components can be calculated. Thus, one instantaneous measurement or cycle consists of an ensemble of instantaneous individual antenna complex channel responses obtained through cross-correlation between a transmitted pseudorandom sequence and an identical, internally generated sequence in the receiver. The channel sounding process tries to measure the channel impulse response, . In channel modeling, it is usual to assume a sufficiently large bandwidth so that the impulse response is made up of complex deltas (ideal channel response). The band limiting effects are considered later when the impulse response is converted into a tapped delay line (TDL); fitting the bandwidth requirements of whatever system has to be simulated. In general, the results obtainable from the analyses reported should be valid for systems with RF bandwidths smaller than that of the channel sounder, that is, 200 MHz (chip rate 100 Mcps). Moreover, the impulse response is not constant in time but time-variant, that is, . This imposes some constraints on the sounding process (the duration of one full instantaneous measurement or cycle) whereby sounding has to be carried out at a rate consistent with the rate of change of the channel (its coherence time). Assuming that the sounding process is fast enough, it is possible to consider the channel impulse response to be constant over the duration of one cycle. where is the channel sunder correlation pulse. Two kinds of parameters were extracted from the measurements; the first group has to do with the entry loss and the other with the time dispersion effects. For extracting the entry loss, the measured averaged power delay profiles (APDPs) were compared with a reference measurement carried out outside each building. Averaging took place over several cycles to remove possible enhancements and cancellations at particular delays. This criterion was later changed to take into account only the direct, LOS contribution as illustrated in Figure 1. Measuring the building entry loss model. is a distance correction factor needed when the reference measurement has been carried out at a different distance than that used in the indoor measurement. and are the measured APDPs. This implies that the direct, line-of-sight (LOS) contribution power outdoors is assumed to be 0 dB, thus the extracted model parameters (see Section 3) will be referred to the conditions just outside the building. Their transformation into absolute values is straightforward. The brief description of the buildings where the measurements were performed is as follows. A large shopping center in an open area with no high buildings in the vicinity. External walls are made of reinforced concrete. Roof is flat consisting of several layers including 25 cm thick reinforced concrete, 11 cm thermal isolation layer, and 5 cm gravel. All internal walls are made of wallboard. The windows are made of thermal protective glass. The receiver was located close to the window. A house in open area with no other houses in close vicinity with 45 cm thick external walls made of light concrete. Roof is made of wooden framing covered with concrete roof tiles. The internal walls are made of 10 cm and 25 cm thick light concrete. There were in total six different measurement positions of the receiver within the house all deep in the building. Airport building made of mixture of steel, metal construction elements, and glass coated with sun protective layer. The roof is of steel construction covered with metal sheets and with layer of gravel. Internal walls are made of plasterboard and glass. First measurement point was airport gate 10 at ground level with the receiver located close to external glass wall. Second measurement point was a conference room with glass wall in the first floor adjacent to a 20 m wide terrace. Open construction of reinforced concrete. The roof consists of concrete layer, thermal isolation, and roofing. Gate area is separated by glass walls. Windows are made of two-layer silver coated glass. Aluminium lamellas are placed in front of the windows as sun protection. There were in total nine different positions of the receiver within the gate area. Seven-storey building in built-up area. The multipath effects of surrounding buildings are supposed to be negligible. Walls made of 18 cm reinforced concrete. Flat roof made of layers of reinforced concrete, thermal isolation, and gravel. Internal walls are made of cardboard and plasterboard. The receiver was placed on the seventh floor in six different positions. The building is a round tower: open construction of reinforced concrete. Internal walls are of light construction with glass elements. Outside mounted façade is made of metal grid and glass panels. The windows are made of glass coated with sun protective layer. Two main measurement locations were chosen on the 22nd and 44th floor at heights of 70 m and 130 m from ground, respectively. Measurements were performed in two rooms on the 22nd floor with two positions in one room and three positions in the other room. On the 44th floor, measurements were performed in two rooms with four receiver positions in one room and three receiver positions in the other room. Figure 2 shows the results of building entry loss for each particular measurement site. The results shown are average values of the loss for all building entry angles and for all positions of the receiver within each particular room. The lowest entry losses were measured in Graz airport conference room. This is because the room has glass external wall and is just under the roof. The highest entry loss, on the other side, was measured for the shopping center. The shopping center has massive external walls and the room in which the measurement was performed was under the strengthened part of the roof which serves as a helicopter pad. Quite high values of penetration loss for residential house could be explained by the fact that the positions of the receiver were deep in the house and not close to windows. The higher entry loss for 22nd floor of Millennium tower compared to 44th floor follows the rule of decrease of entry loss with floor level but it could also be explained by larger distance of the receiver from exterior wall on the 22nd floor. Entry losses for other measurement sites are in the range of 20–25 dB. Building entry loss; the rectangle represents the mean loss, the line shows the minimum-maximum interval. Building entry losses as a function of elevation are shown in Figure 3. It can be seen that the highest entry losses occur for the elevation between 15 degrees and 30 degrees with decreasing loss between 30 degrees and 60 degrees. Entry loss values for all buildings as a function of the elevation angle. where L is the building entry loss (dB) and α is the building entry angle going from 0–90 degrees. The building entry loss for 0 degrees (grazing incidence) is 28.5 dB. 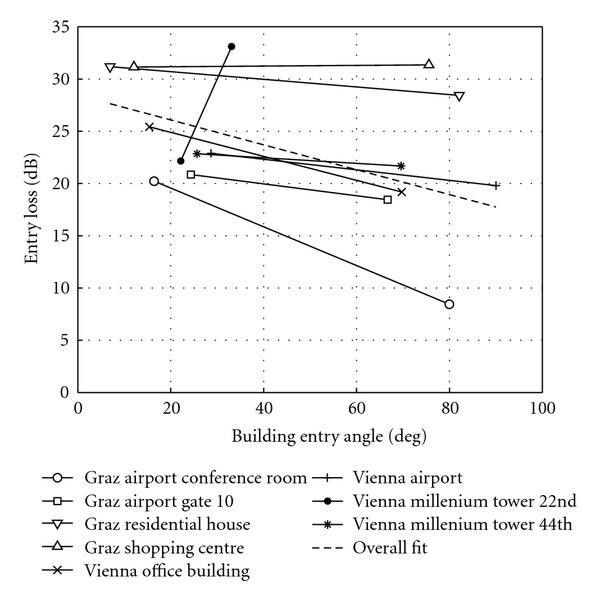 Entry loss versus building entry angle, Graz airport conference room. Linear approximations of building entry losses for all measurement sites. Figure 6 displays average entry loss as a function of the rms delay spread for each measurement location. It can be observed that the delay spread value is related to the size of the room in which it was measured, that is, the larger room, the higher value of delay spread. What can also be seen is the trend of increasing delay spread with decreasing entry loss. This could be explained by the fact that with lower entry loss, the entering rays carry more power and some of them can be multiple reflected within the room before arriving at the receiver resulting in longer propagation times and therefore higher delay spread. Average entry loss versus mean delay spread. This paper presented results of a measurement campaign simulating the HAP-to-indoor channel at S-band. A helicopter was used to carry the transmitter and SIMO channel sounder placed inside several buildings was used as a receiver. Measurement results of building entry loss and delay spread are presented. Building entry loss measurements in eight different locations correspond well to the building material and type of the building, that is, the lighter construction, the lower loss. The building entry losses as a function of building entry angle are presented. They follow a general trend of decreasing loss with the entry angle. 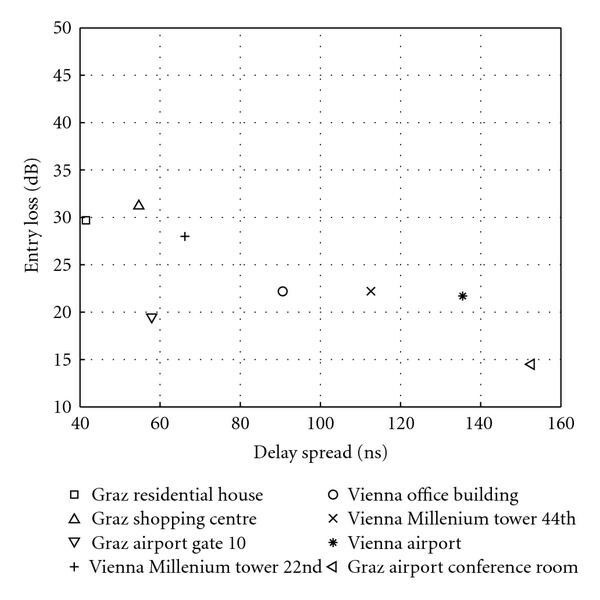 Finally, the measured delay spread in different rooms shows higher delay spreads for larger rooms. This work is being performed under ESA/ESTEC Contract no. 19769/06/NL/GLC. Some of the authors are members of COST 297—High Altitude Platforms for Communications and Other Services (HAPCOS).